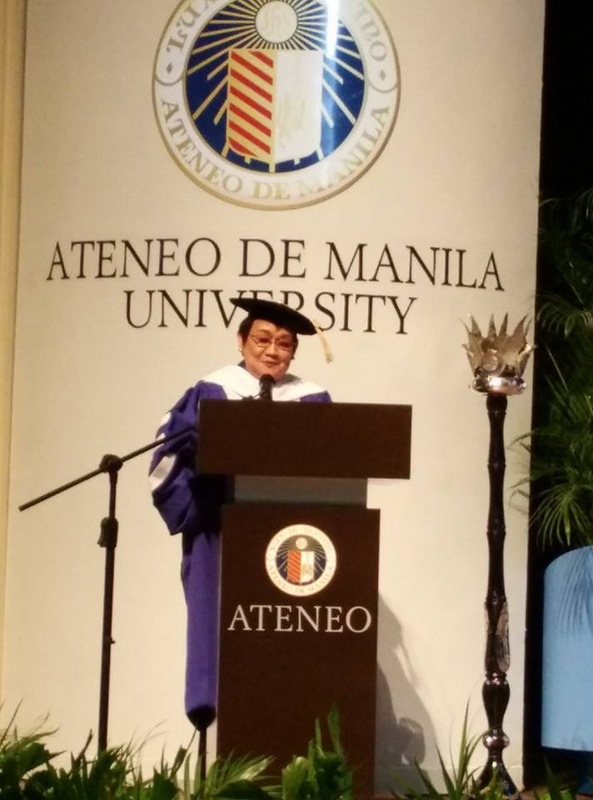 Thank you to all who greeted and congratulated our founder and president Dr. Ma. 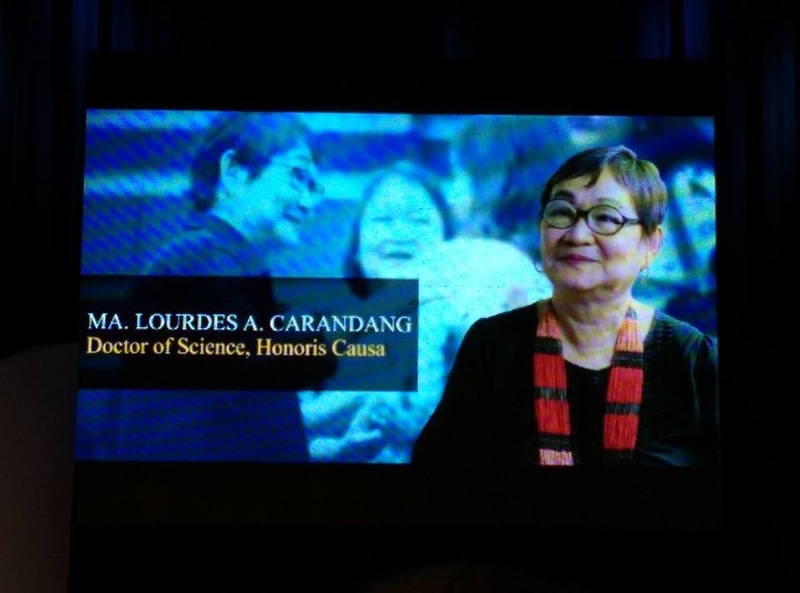 Lourdes “Honey” A. Carandang for being awarded Doctor of Science, honoris causa, last Sept.22, 2015 by the Ateneo de Manila University. 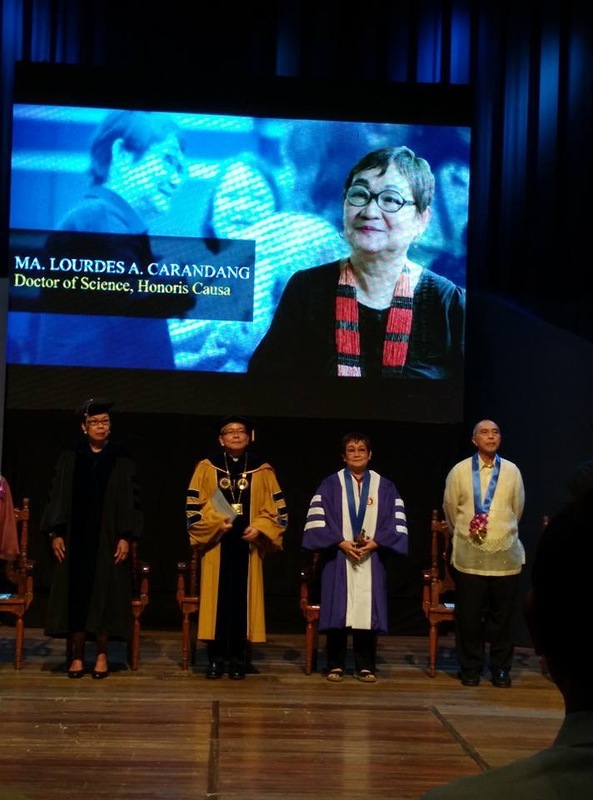 Dr. Carandang delivers her response during the special convocation. By Ma. Lourdes A. Carandang, Ph.D.
Isang magandang hapon sa ating lahat.. a beautiful afternoon to all of us..
Fr. Jett Villarin, esteemed administrators and professors, students, my dear family and friends, I am deeply grateful and honored, and much elated to receive this award. “Doctor of Science” at this time in my life. Thank you all for being here today. This award is very meaningful to me because it recognizes and affirms my fundamental beliefs and life work, as a scientist, practitioner and particularly as a psychologist. Thank you Ateneo! By synchronicity, today is the birthday of my mentor in Clinical Psychology, Fr. Jaime Bulatao, SJ, National Social Scientist. Happy Birthday Father Bu! My mentor in Experimental, Behavioral Psychology and research was the National Scientist, Dr. Alfredo Lagmay from the University of the Philippines. And, of course my real life mentors were my parents who gave me a solid set of core values, Otilio and Liwayway Arellano. Wherever you all are, this is for you! Thank you for giving me this opportunity and time to speak to you on my own views about science and scientists. The 1st is: that science must not be confined in the laboratories, classrooms, lecture halls, clinic and even in national and international journals. We need to go beyond the “publish or perish” tradition, which is very common in the west. Because ultimately, science or scientific principles and research findings must be used for the upliftment of the lives of all persons, from all social classes and subcultures in our country and in the world. Allow me to share a bit about my own life as a psychologist. After more than 3 decades of teaching, mentoring, research, publishing in journals and books and clinical practice, I formally established the MLAC Institute for Psychosocial Services, Inc. in 2010, with a group of highly trained, clinical and developmental psychologists. Our shared mission is to use the science of psychology for the well-being of persons especially the disadvantaged, the poor, the marginalized and the traumatized. One cannot do trauma work alone. One must have a group of competent and committed persons who share the same belief and conviction. Aside from accompanying survivors of disasters in 1990, killer quake in Carranglan, typhoons in Naga, Quezon, CDO (Sendong), Davao (Pablo), and Tacloban (Yolanda or Haiyan), we are also doing non-trauma work such as Parenting workshops for all social classes; but focused on the poor barangays of Payatas, Tumana, Loyola, Antipolo, Cavite and moving to other communities. It is so fulfilling to hear a parent say after participating in the parenting workshop “Ang pananakit sa bata ay hindi pala disiplina. Akala ko disiplina yun, pang-aabuso pala yun. Hindi ko na gagawin ulit at sasabihan ko rin ang aking kapitbahay”, affirming our flagship program that “Parenting is Nation-building”. By the way, MLAC initially stood for my initials. Now, it is the acronym for Mindfulness, Love And Compassion. A scientist is: a curious observer. A scientist is: an innovator. A scientist is: a communicator. As innovator – we don’t just adapt existing concepts to fit our culture. But we also create new concepts and formulate new theories, based on our own experience and the experience of people in our culture and subcultures… that reflect and capture the “guts” and “soul” of the Filipino. Then, we document this, share it with our colleagues for further research and refinement.. and then we share it with the other countries in the world. Some examples of these indigenous concepts are tagasalo, pakikiramdam, pakikisalamuha, etc. The scientist is daring and creative. The scientist must practice MINDFULNESS and INTEGRITY observing the highest ethical standards. This is relevant to psychologists because many of us have been licensed after waiting so long. We must be careful not to use our license as a “license” to cross over different areas of specialties that we are not trained for or are competent in. We must know the scope and limits of our expertise. Mindfulness means to be aware of what’s happening inside you, around you and how you affect others. It is practicing with compassion. Gandhi reminds us of what he calls a social sin: “science without humanity.” Let us ask ourselves: “Why am I doing this? Is it really for the good of the people I’m serving or for my own good, my ego? What are my real motives?” Pausing, reflecting, being aware of what’s happening at the moment, giving our true presence and deep listening to the other person is practicing MINDFULNESS. To practice with INTEGRITY, we must be honest with ourselves and with others. We must present our data truthfully. We must be authentic. We must, first of all, be persons with integrity, who uphold our own dignity and the dignity of families and communities we serve, especially the children. We offer to heal them through a process that respects them and upholds their dignity at all times especially in the worst of times. To end, as one of the greatest scientists of all time, Albert Einstein said “Most people say that it is intellect that makes a great scientist. They are wrong. It is character.” Thank you for listening. 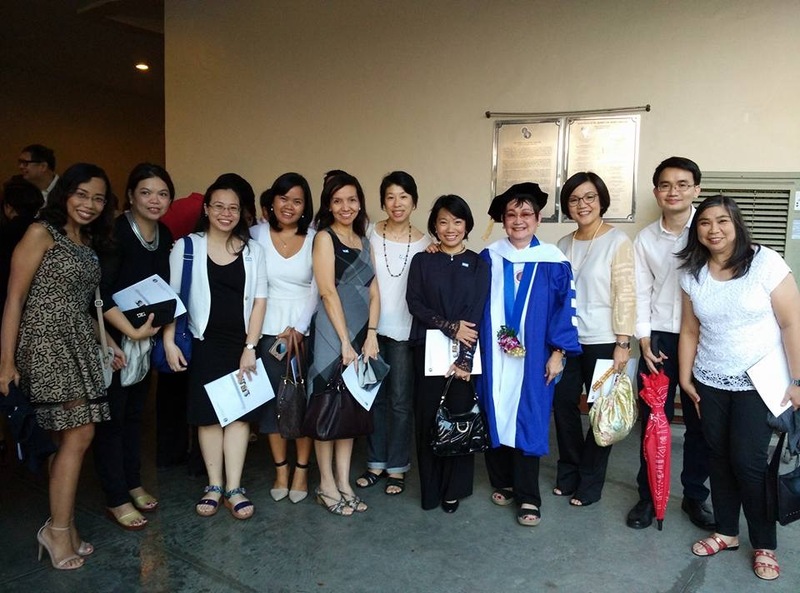 The MLAC team with Doctor of Science, honoris causa, awardee Dr. Honey Carandang. Dr. Honey Carandang with CHED chairperson Dr.Patricia Licuanan, ADMU president Fr. Jett Villarin, and fellow awardee Ed Garcia.